I finally decided to take a stab at recreating it at home and the results were really good! I took a shortcut by using broccoli slaw, which can be found at most markets. I also added savoy cabbage and scallions for a more authentic flavor and some cashews for crunch. The salad was light and healthy and the mint, cilantro and basil lent a fresh, summery taste to the dish. I also added slices of flank steak that had been rubbed with brown sugar and chile powder for a sweet and spicy protein. For me, it’s the perfect summer salad. If you’ve got a grill, I would prepare the steak with the rub and throw it on the grill. You’ll get a nicer char than if you follow the method below. Since this salad is served at room temperature, you can grill the steak and prep the vegetables and dressing ahead of time if you’re having company over. Just make sure you keep the steak in an airtight container so it won’t dry out. If you can’t find broccoli slaw at your market, substitute a couple of shredded carrots and a shredded daikon or jicama. Preheat the oven to 325° and set a large, heavy bottomed skillet over medium-high heat. Combine the brown sugar, chile powder and salt in a bowl and rub it all over the meat. Once the pan is hot, sear the steak for 1 – 2 minutes on each side. Pour the lime juice over the steak, tent the pan with some foil and place it in the oven for 12 – 20 minutes, depending on how rare you like it. I leave it in until the inside is just pink, about 16 minutes. Once it’s done, remove from heat, let it stand on a cutting board for 10 minutes, then slice into thin strips. Make the dressing by whisking the ingredients together until the sugar has dissolved. Toss the broccoli slaw, scallions, cabbage, mint, basil and cilantro in a very large bowl, making sure the vegetables are all evenly distributed. Add the noodles, then the dressing and toss until the noodles and vegetables are evenly distributed and coated with the dressing. 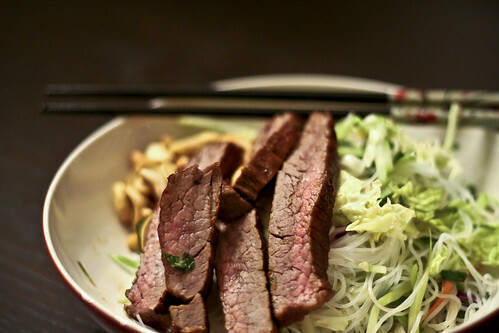 To serve, place a heap of the noodles in a bowl (make sure you pull from the bottom so they’ll be dressed), add a few slices of steak and a small handful of cashews. I like to keep a bottle of Sriracha on the table in case anyone wants to spice it up (of course). A perfect recipe as the weather starts to warm up! that looks really good. can’t wait to try this. Tried your recipe, great! I used napa instead of savoy, and I assumed that you meant sucanat for the natural cane sugar? /anyway, thanks! Glad you liked it Edlear! I actually buy Florida Crystals “Natural Can Sugar” – it’s coarser and darker than the normal, refined stuff. Not sure what sucanat is? Itâ€™s good, itâ€™s useful (as usual), actionable and concise. Love it.